Your little one will be adorable trick-or-treating in this cute black-cat hat. 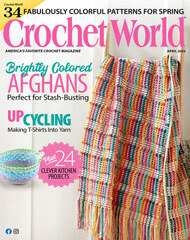 This e-pattern was originally published in the October 2011 issue of Crochet World magazine. Size: 6 to 12 months. Made with medium (worsted) weight yarn and sizes J (6mm) and K (6.5mm) hooks.